Moreover, despite a few great photos, I'd have liked to have seen more of the clothes in situ and particularly more archive footage. We were given the well-worn yet still fabulous Pathé shots of West Indians arriving at cold windswept British docks in the '50s, and a fantastic late '70s 'home movie' by Don Letts. There was an engaging film playing in the exhibition's 'cinema', but I'd liked to have seen actual footage scattered in and around the clothes more. There must be so much great footage - you'd think TOTP alone could contribute a few hours. I know full well how (ludicrously) much it costs to incorporate video in exhbitions, but the clothes lose a little of their vibrancy left hanging. Still, there's some wonderfully evocative stuff: a wall of Goldie's trainers and hoodies; 2-tone Pork Pie hats and gold batty riders; Guyanese dresses and rastafari canes. I sneaked a couple of shots. 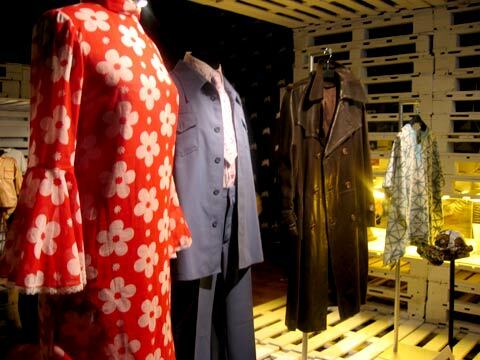 This display is near the start, taking style from the 60s to the 70s. Check the Shaft-style leather coat! 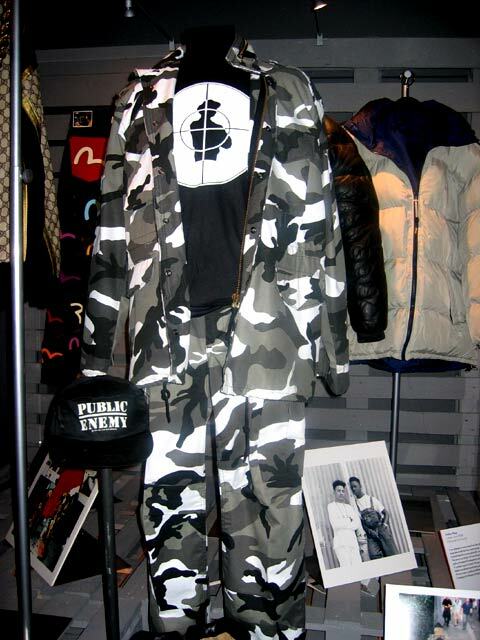 Black British Style exhibition. At the V&A museum, London, until 16 January 2005.